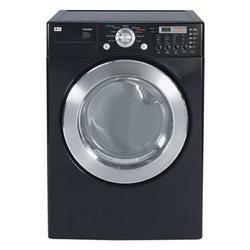 I really love my LG front-loading washing machine! It is amazing how little water it uses and still gets the clothes super clean! The thing I love most is all the settings. Most of my clothes are delicates, so I really appreciate the Delicate, Extra Delicate, and Hand Wash settings. It has really saved my clothes - my top loader tore up my clothes real quick and sometimes made them smaller. My husband works a lot outdoors, so the Heavy Duty cycle really helps me get his tough to clean clothes clean! There is also a SaniRinse so that if anyone is sick in your household, you can makes sure the illness doesn't spread through the clothes! For towels and jeans, the spin cycle for is amazingly fast. It almost sounds like the washer is getting ready for take off! By the time the spin cycle is done wringing out the water, the dryer has very little work to do. Most of the time the machine is really quiet and I can't even remember if I turned it on! The tub is really roomy and I can fit a ton of towels and all my bed sheets and my mattress pad. When it is done, it lets out a beep, which you can control the volume of. I think that is a really nice feature for someone who is absent-minded like me. My detergent seems to last forever, because it uses so little. I suggest buying the pedestals to store all your equipment in. One of the things I don't like is that I can?t add clothes if I discover them later on, since the door is locked. It also takes a little bit more cleaning than my top loader because any hair or dust that is on the clothe get stuck on the window and water gets trapped in the rubber part where the door closes. It has acquired kind of a smell, but I believe they make special cleansers for HE washers. The other bad things is I can?t talk my husband into helping out with the laundry anymore, because he thinks all the buttons make it too complicated!